BTC/USD is being traded at $3,984 as the part of a correctional flat. The price is trying to turn the area of $4,000 in support zone once again. We will see what will be the result of this in the nearest future. Nevertheless, until the bottom is broken, it’s too early to talk about the continuation of the bearish trend. The technical forecast remains the same. Now the price has returned to the “balance” zone. Further, the price is likely to fall to the local bottom to $3,700. This area has long been intended to be tested by the price. Probably this mark will attract the price until it will be tested. As part of the forecast for December 5, we can expect the continuation of the correction within the boundaries of the trading range of $4,500 – $3,600. Signal area continues to remain fairly narrow $4,056 – $4,025. This is a dynamic zone of the “balance” of the asset price for the next day. The price will tend to return to this value after moving higher or lower. For now, it is slightly lower and it is likely that the price will test it again, and then go to the lower area of the $3,700 – $3,600 trading range. An alternative would be to continue the development of a full upward correction. To start with, the price will have to break through $4,500 and go to the first goal of $4,740. We can expect growth in the resistance zone of $5,500- $5,000 later on. ETH/USD is being traded at $111.93 as part the of a correctional flat. Returning to the zone of “balance”, the price encountered with tremendous pressure from sellers in this area. Most likely, the coin will test the following key support at the levels of $101.00 – $100.00. There is also a high probability that for the moment it drops below $100.00. Do not forget that at the level of $99.00 the dynamic support is located. It is unlikely to freely miss the market below. Breakdown of this area will lead to a fall to the levels of $89.00 and $83.70. As part of the forecast for December 5, we can expect the continuation of the correction within the trading range of $130.00 – $100.00. Signal area continues to remain fairly narrow $113.80 – $112.70. This is a dynamic zone of the “balance” of the asset price for the next day. The price can be pushed both up and down from it. For now, it is practically on it and a slight upward rebound is possible before the quotes go to the lower area of the local trading range of $103.50 – $100.00. XRP/USD is being traded at $0.35707 as the part of a correctional flat. Bears continue to control the price of the coin in both the short and medium term. The technical forecast remains the same. We look forward to the development of the “domino” effect and breakthrough down savings of $0.40770 – $0.34590 and $0.43000 – $0.32890. After that, the boundaries of the upcoming flat may be formed. At the moment, its time frame is $0.43000 – $0.33000. As part of the forecast for December 5, we can expect the continuation of the correction within the trading range of $0.40500 – $0.33000. The signal area continues to remain fairly narrow $0.36340 – $0.36010. This is a dynamic zone of the “balance” of the asset price for the next day. The price can be pushed both up and down from it. For now, it is practically on it and a slight upward rebound is possible before the quotes go to the lower border of the local trading range of $0.33000. Since market participants are not sure yet whether the bottom has been reached or not, large volumes on the part of sellers can renew a minimum of the drop. In this case, support will be at the level of $0.31000. An alternative would be to continue the development of a full upward correction. To start with, the price will need to break through $0.40500 and go to the first goal of $0.43000. We can expect growth in the resistance zone of $0.50000 – $0.45000 later on. XMR/USD is being traded at $57.469 as the part of a correctional flat. The price of the coin before all the others practically tested the minimum of the whole fall. A very sluggish rebound from the local bottom area suggests that this mark will probably be broken. In case of a pulse drop, the price may be at the level of $46.000. With a gradual decline within the downward channel, the price can reach $50.000. 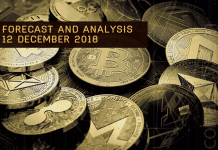 Taking into account the peculiarities of this coin, about which we have repeatedly written earlier, the next wave of the fall is likely to be awaited by the whole cryptomarket before the upcoming holidays. As part of the forecast for December 5, we can expect the continuation of the correction within the range of $65.000 – $50.000. Signal area continues to remain fairly narrow $58.000 – $57.500. This is a dynamic zone of the “balance” of the asset price for the next day. The price can be pushed both up and down from it. For now, it is practically on it and a small upward rebound is possible before the quotes go to the lower area of the $53.000 – $50.000 trading range. An alternative would be to continue the development of a full upward correction. To start with, the price will need to break through $65.000 and go to the first goal of $72.000. We can expect growth in the resistance zone of $86.000 – $78.000 later on.